by John - March 8th, 2014. Filed under: Harrod Horticultural, New Products. 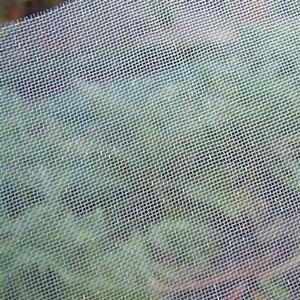 Insect Mesh Protection Netting Is A Fine Mesh, Heavy-duty, Uv Stabilised, Long-lasting Netting That Effectively Keeps Out Minute But Common Garden Pests Such As Carrot Fly, Cabbage Root Fly Along With Butterflies And Birds – And As Its Made From 100% Polyethylene, Its Light Enough To Be Laid Directly Over Crops Or Form A Very Effective Barrier When Placed Over Crop Protection Hoops. the Insect Mesh Protection Netting – With Its Pest-busting 1.35mm Square Mesh – Is Available In 2, 2.5 And 3 Metre Widths And Every Gardener Who Values Their Vegetables Should Have Some!